Hi everyone! Hope your week has gotten off to an awesome start! 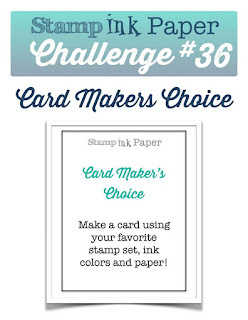 Today I'm back over at Stamp, Ink, Paper with my Design Team card for a Challenge that couldn't possibly be easier... Card Maker's Choice! Well, how easy is that?? The hard part is deciding which of the awesome stamp sets to use! Now here is where it gets real.... what stamp set do I use?? My three favorite Stampin' Up! Sets are Traveler, Hardwood, and World Map (I think... at least they seem to be) but I wanted to play with a set that I haven't had a chance to stamp with yet... Altenew Vintage Roses! But you may have noticed that I did break out the Hardwood Stamp for the background! I also had the opportunity to use an embossing folder that I have been wanting to try out... Darice Basketweave! All in all, this has been a fun cardmaking day! My card base was a 11" x 4 1/4" piece of Daffodil Delight Cardstock. I added a skinny layer of whisper white that measured 5 3/8 x 4 1/8". My hardwood layer was a 5 1/2" x 4" piece of Sahara Sand stamped with Tip Top Taupe. I sponged the edges with some Crumb Cake Ink as well. A strip of white was added to the bottom with Tip Top Taupe Dotted Lace Trim secured to the back with Tear Tape. My "basket" was a circle of Whisper White Cardstock that was dry embossed with the Darice Basketweave Embossing Folder. I adhered it to the hardwood layer tucking the bottom just below the Lace strip. My roses from the Altenew Vintage Roses stamp set were stamped with Daffodil Delight, Crushed Curry, Hello Honey and Delightful Dijon. The leaves were stamped with Pear Pizzazz, Old Olive and Mossy Meadow. I used the Altenew Vintage Roses Dies to cut out both my roses and my leaves. 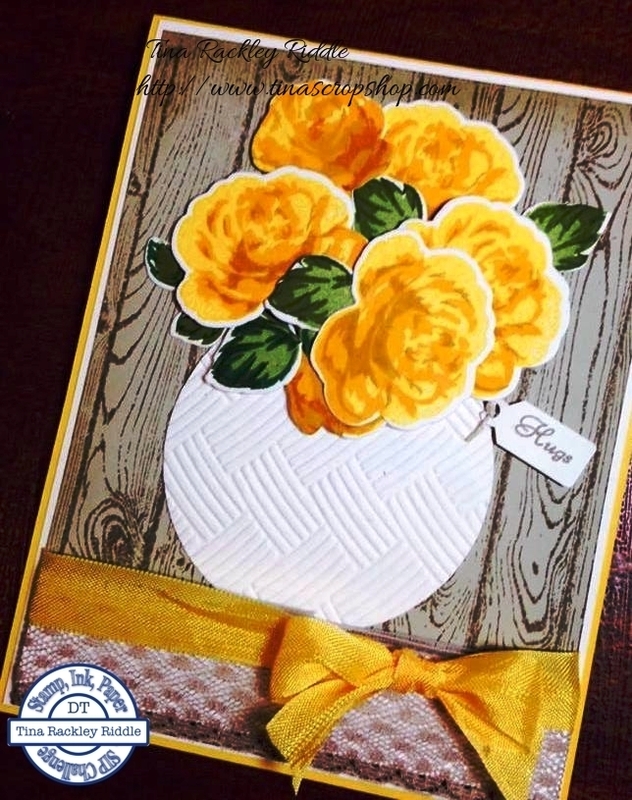 Some of the roses and leaves were adhered with Tombow Multipurpose Glue and others were adhered with Stampin' Dimensionals. I added a "Hugs" sentiment that was stamped in Tip Top Taupe onto Whisper White Cardstock and punched out with the retired Jewelry Tag Punch. Last but not least, I added some Daffodil Delight Seam Binding around the lace layer and tied it in a bow in the front right side. I'm not sure why I always want my bows tied on the right side, maybe because I'm right handed?? Do you have a preference?? Oh well, that's what I seem to do! Aww.. thanks so much my friend! Beautiful blooms, and perfect on the hardwood...I love that stamp,too! your card looks fantastic! very beautiful!